What is Nordic Walking and how can it help people with neurological conditions? Did you know that Nordic Walking can change your brain? Many neurological conditions can significantly benefit from learning how to Nordic walk as it is not only a great way to exercises but also an excellent gait retraining tool. 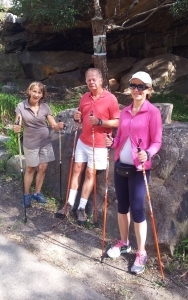 Our Nordic walking courses are run in small groups of a maximum of 4 participants. To achieve the best results from the course you do need to have initial assessment of 1 hour prior to start the course to ensure that you are placed in the best group and really maximise on achieving your outcomes. Venue and times: Initial assessments conducted at either AUT Millennium (North Shore) or West Wave (Henderson) then group sessions are held in various locations to suit the current group participants.